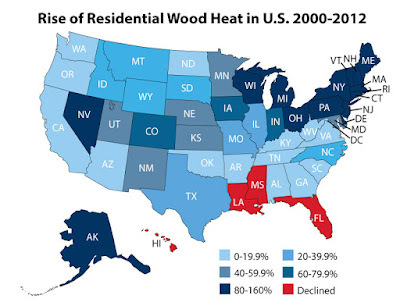 Updated, Jan. 23, 2017: Wood heating has made a comeback in the United States and has been the fastest growing heating fuel for most years since 2005, according to US Census figures. Currently, 2.36 million homes in the United States use wood as a primary heating fuel (ACS, 2015, 1-year estimates). And 8.8 U.S. million homes use it as a secondary heating fuel (EIA, RECS, 2009). 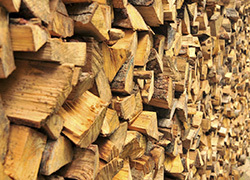 Wood was the dominant residential heating fuel in the United states until coal began to take over in the 1880s. After that, heating oil and then gas became popular. The percent of the population primarily heating with wood dropped from 23% in the 1940s, when the US Census first began tracking heat, to a low point of 1.3% in 1970, when fossil fuels were cheap and popular. The first map shows shows county level particulate matter from residential wood combustion based on the 2011 National Emissions Inventory, Version 1.5. 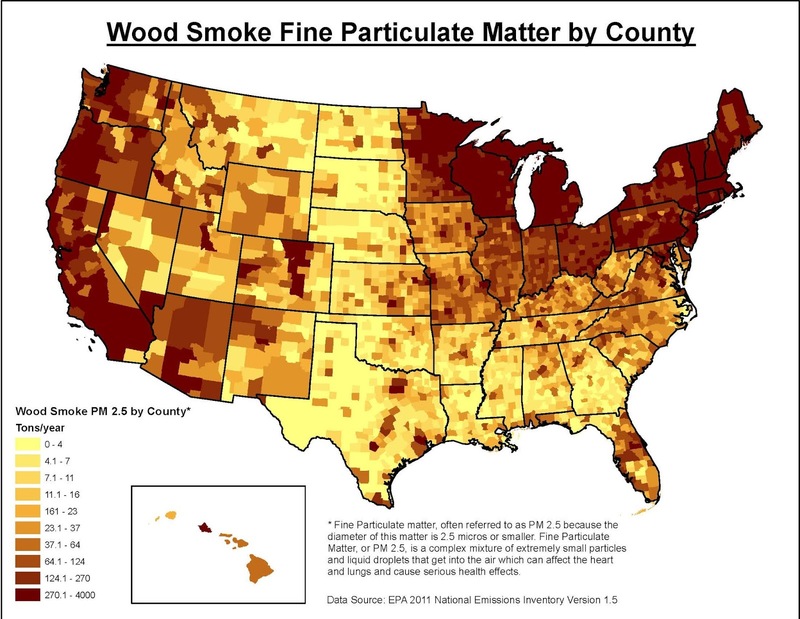 The EPA should be releasing data from the 2014 National Emissions Inventory this year, so that residential wood smoke changes can be compared from 2011 to 2014. 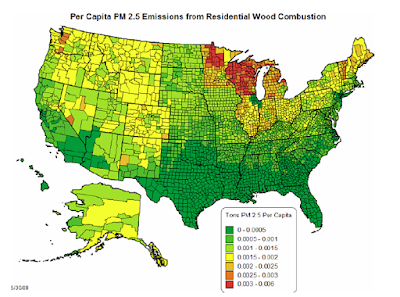 This second map also shows PM 2.5 emissions from residential wood combustion by county, but its on a per capita basis according to the 2008 National Emissions Inventory, in this EPA report, "New Methodology for Estimating Emissions from Residential Wood Combustion." It appears to show the densest per capita concentrations of PM2.5 in Wisconsin and Minnesota where the most outdoor wood boilers are made and installed. 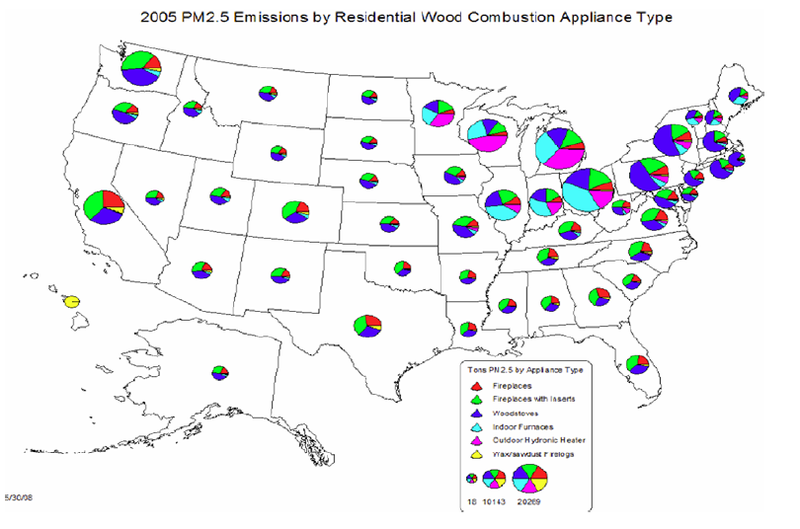 The third map, from the same 2008 EPA, report provides further detail on the source of PM 2.5 emissions by appliance type. Each appliance type is represented by a different color. Red represents fireplaces, green represents fireplaces with inserts, dark blue represents woodstoves, light blue represents indoor furnaces, magenta represents outdoor hydronic heaters, and yellow represents wax/sawdust firelogs. While the terminology is somewhat confusing, the map shows some interesting trends. For instance, wood stoves emit the majority of PM in the Northeast, while outdoor hydronic heaters are the largest source in the Great Lake states (outdoor wood boilers continued their popularity in these states after the 2008 EPA report). Fireplaces with inserts are the largest emitter in most of the south and California. 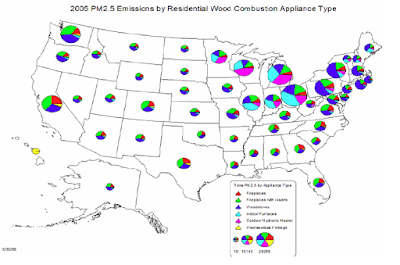 Indoor furnaces are the most common source of PM pollution in Ohio, Indiana, and Illinois. 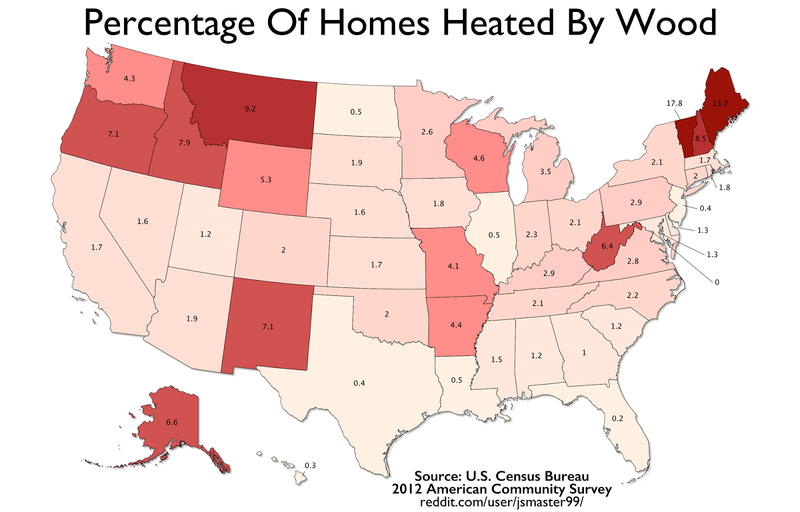 The next map was produced by the Census Bureau, showing per capita use of wood stoves. It shows 17.8% of homes in Vermont use wood or pellets as a primary heat source in 2012. Maine had the second highest percentage at 13.7% of homes. Out West, Montana has the highest percentage with 9.2% of homes, followed by Idaho at 7.9% and Oregon at 7.1%. On the US mainland, the states with the least wood heating are predictably Florida, at 0.2% of the population and then Texas at 0.4%. 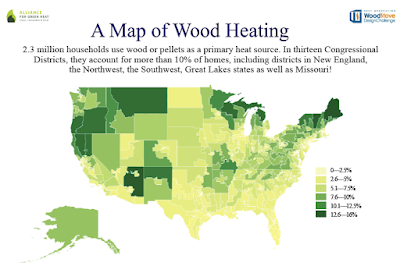 The Alliance for Green Heat produced a map using Census data to show the continued growth of wood heating between 2000 and 2012. By 2010, the growth trend was well established, due in part to the housing crisis and recession. In that period, wood heat doubled in about 10 states, mostly in the Northeast. This map below, made the Alliance for Green Heat, also uses Census data but breaks down primary wood heating households by Congressional districts. This provides a much more detailed look at the geography of wood heating compared to state level details. Presumably, a map showing wood usage at the county level could also be produced. This last map shows a curious phenomenon in 1950 where the Census Bureau found higher rates of primary wood heating in southern states than in many northern ones. This is likely due to the quicker penetration of fossil fuels in northern states, whereas room heaters in southern states, including those in many poor, rural black and white households, continued to operate on cordwood. any price increase of the EF2. When the EPA began posting actual efficiencies on its list of certified stoves, all of sudden consumers could see which brands of pellet stoves were saving them more money in fuel costs and which weren’t. A popular pellet stove, the EF2, made by a prominent brand, Enviro, turned up at the very bottom of the list at 58% efficient, surprising many. The company had been advertising the stove at 87% to consumers. Enviro appears to have redesigned the stove in an effort to avoid the distinction of having the least efficient stove on the EPA list. In July of 2016, Enviro tested their new version, the EF2-1, only a year after testing the older version, and it came in at 77%, nearly 20% higher than the old version. Now, due to greater scrutiny, they also advertise to consumers that the stove gets 77% efficiency. At the same time they lowered the emissions from 1.8 grams an hour to 1.4 grams an hour. Their carbon monoxide values also went from 25 grams an hour to 7 grams an hour, a dramatic improvement. 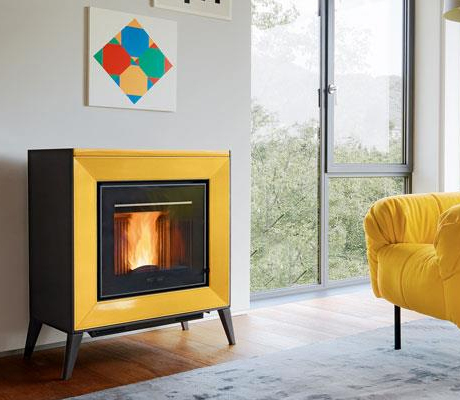 The US Stove model 5660 is now one of the least efficient pellet stoves on the market at 62%, but the company still says that it is eligible for the 75% federal tax credit. St Croix makes two pellet stoves, the Hastings and Ashby, that each tested at 66% efficiency by EPA-approved test labs. However, the company website claims that the Hastings is 83% efficient and that its “efficiency ratings are verified by an independent lab.” The Hastings owners manual confirms that the independent lab rated the stove at 66% efficiency. The tax credit is set to expire on Dec. 31, 2016. 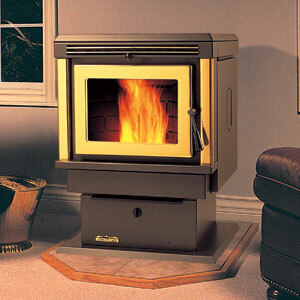 The Enviro EF2-1 is also sold by Hudson River Stove Works under the brand names Chatham, Davenport and Kinderhook. Despite the lab test showing the stoves are 77% efficient, Hudson River Stove Works continues to tell consumers that they are 85% efficient. Unlike the manufacturers of automobiles and major appliances, there is nothing stopping wood and pellet stove manufacturers – or their retailers – from blatantly misleading consumers, as Hudson River Stove Works does. The EPA has made efforts to bring more transparency by requiring manufacturers to post the test lab documents on their websites. These documents show additional details about the stove, including its carbon monoxide levels and emissions results at each burn rate. Enviro is one of the companies that complies with this rule and posts this information so that consumers can see testing information about the EF2-1 here. In the November update to the EPA list of certified stoves, the EPA added a column for carbon monoxide, as all stoves tested after May 2015 have to test for and report their carbon monoxide emissions levels along with their particulate matter emissions and efficiency. However, the EPA has only input the CO test results for eight stoves as of December 14, 2016. The EF2-1 at 7.4 grams of CO per hour has the lowest. The five non-cat stoves with CO values range from 87 to 186. States and counties are increasingly looking to wood stove change out programs to encourage people to give up old, polluting wood stoves for cleaner alternatives. In 2016, there were 34 stove change-out programs. The average incentive was about $900 to replace and old wood stove with a new one, $1,300 for a pellet stove, $1,500 for natural gas stove and $1,900 for a heat pump. Trends in 2016 change-outs include more programs only allowing old wood stoves to be replaced by pellet, gas or electric appliances; more bounty programs that pay for decommissioning both old and newer wood stoves; more programs requiring or considering lower particulate matter standards for eligible stoves; and increased documentation for stove retailers and program managers. Stove change-out programs are often compared to “cash-for-clunkers,” the $3 billion program in 2009 to get older, more polluting cars off the road. That program became more controversial as program performance data was evaluated. Stove change-outs are also often criticized for not providing enough benefit per dollar invested. This Online Stove Change-out Resource Center strives to help maximize benefits for local air quality, participating households and the manufacturers of cleaner, more efficient heating appliances. This Resource Center was also designed to be a resource for a national change-out fund, like the federal diesel program to replace older diesel engines. Several members of Congress had been working on federal funding for a stove change-out fund and it is now unclear if that goal may be more difficult under a Trump Administration. “Stove change-out programs are a great tool for communities to reduce excessive wood smoke pollution but many programs underperform,” said John Ackerly, President of the Alliance for Green Heat. “Best practices developed by innovative change-out managers need to be integrated into more programs,” he added. Tips for Homeowners, to navigate the process of buying a wood stove and keep costs down. This Online Resource Center is the most comprehensive summary of change-out programs in the US with details about their budgets, eligibility requirements and innovative features. It is based on extensive research of each change-out program and interviews with scores of change-out managers, stove retailers and experts. The Resource Center is an ongoing project that welcomes input and corrections from all stakeholders. Please send comments to info@forgreenheat.org. This Online Resource Center was supported in part by the Osprey Foundation. Content for the Resource Center was written by Melissa Bollman and John Ackerly, staff at the Alliance for Green Heat. The Alliance for Green Heat is an independent, non-profit organization that promotes cleaner and more efficient wood and pellet heating. In our October newsletter, we reprinted a column by Cory Hatch from the Jackson Hole News & Guide. We found it to be a thoughtful piece by a person grappling with energy choices and trying to fairly weigh their costs and benefits. We got a lot of positive feedback about the article but one reader, a former professor of thermodynamics thought it was important enough to clarify something the author said. "After you factor in the energy and associated emissions it takes to extract, refine and transport fossil fuels, wood starts to look pretty good again. If you harvest trees close to home, firewood is fairly efficient and renewable, even if storing that carbon again takes some time. Unfortunately, woodstoves have local impacts, too. Chimney smoke contains particulates, nitrogen oxides and other gasses that can degrade air quality and cause health problems, especially for people with respiratory or cardiovascular disease." The author also noted: "according to the Sierra Club, burning coal for electricity is only about 35 percent efficient, whereas a modern wood stove is about 75 percent." " It is true that wood is superior in that it is renewable and not a fossil fuel, and it does not contain sulfur or other elements that can be problems in coal stack emissions. But his statement, attributed to the Sierra Club, implying that wood combustion is twice as efficient as coal combustion is incorrect. The distinction is subtle and not appreciated by someone without a background in thermodynamics, but I will try to make the reason clear. Coal power plants probably don’t do much better that 35% as suggested, but wood-fired electricgenerators are even less efficient (for reasons that would require more explanation). Converting the energy content of coal to heat can, on the other hand, be done with high efficiency, matching or exceeding that of biomass combustors. Thus, the statement as worded in Hatch’s column is misleading. His arguments regarding global warming, etc. are ok. I thought you might be interested in the error in case someone else has not already called it to your attention." Periodically we publish substantive comments such as this one on our blog. Scores of shorter comments are left on our Facebook site. If you have a longer substantive comment, we can't promise to publish it but please don't hesitate to send to info@forgreenheat.org.